I want a baseball card of Justine Siegel. 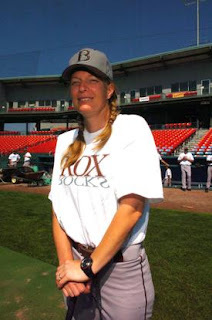 A few weeks ago, the Can-Am League’s Brockton Rox apparently hired the first female coach in professional baseball. I know the Can-Am League isn’t a big deal, but the Quebec team did just sign Eric Gagne. As someone who loves the game so much, I’m proud and envious of this woman. There are so many nights were I’m watching the game and thinking about the different decisions that can affect the game. Spiegel will be one of those people that will have her voice heard in the clubhouse. Here’s a story by The Enterprise of Brockton (Mass.) on Siegal. There are a few typos, but don’t worry about those. Just read the story. And, if you’re in the area, go check out the Rox and tell the manager Chris Carminucci I sent you. Nooch is the man.